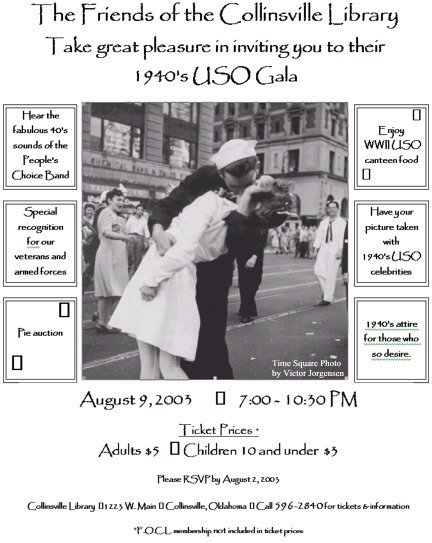 The Friends of the Collinsville Library take great pleasure in inviting you to their 1940's USO Gala. The gala will be held on August 9th from 7-10:30 PM. Attire is dressy casual or 1940's style. This year's Gala features an authentic WWII USO canteen meal, the fabulous 40's sounds of the People's Choice Band and a pie auction benefiting the Friends of the Collinsville Library. Ticket prices are $5 for adults and $3 for children, 10 and under. Memberships in the Friends of the Collinsville Library are also available for $5 for individuals, $10 for families, $25 Donor, $50 Patron or Corporation, $100 Benefactor and $250 for Lifetime membership (individuals only). All proceeds go to the Friends of the Collinsville library and are used to sponsor events at our local library branch. Please call 596-2840 to order tickets, for information on donating pies, or if you are interested in loaning 1940's memorabilia for display at the gala.